LAS VEGAS, Jan. 3, 2017 /PRNewswire/ -- Once again, LiveU is collaborating with leading online broadcaster, BeTerrific to bring all of the excitement of CES to fans online in real-time. As an "Official Media Partner" of CES 2017, BeTerrific will be using LiveU technology in its broadcast location (Central Hall Grand Lobby – second floor above Nathan's) to present its viewers with an inside look at the companies and products shaping the tech industry – live from CES. 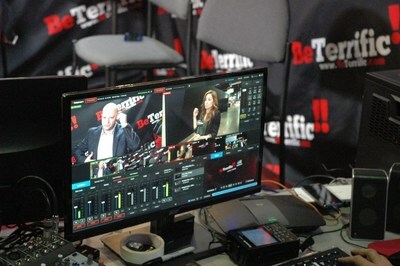 LiveU Solo will enable BeTerrific to switch from the live interviews in studio to a roving reporter covering the various halls and venues throughout the four-day show. To supplement the full broadcast and reach a broader audience online, the LiveU Solo Facebook Live Video Booth will allow BeTerrific guests to interact with fans online before and after their interviews. "CES is the world's gathering place for innovation and each year we look for new ways to cover as much as possible. We used LiveU Solo last year to roam the convention halls more freely and that was extremely successful," said BeTerrific Host, Michael Artsis. "LiveU technology has helped our audience feel as if they were right there in the heart of the action and get exposure to information about products and technology that they might not have been able to see even if they were at CES." "This year, we decided to up the ante and augment the BeTerrific CES broadcast with a dedicated LiveU Solo Facebook Live Video Booth to allow guest interviewees to join the social conversation and interact with their fans and followers on Facebook Live," said LiveU, VP Marketing Americas, Claudia Barbiero. "LiveU Solo provides simple one touch integration to Facebook Live and offers high-quality live video matching that of a broadcaster. We invite CES visitors and guests to stop by the booth to get a demo and see how easy it is to go live using our Solo solution." BeTerrific will be going live during CES 2017 from 8:30 am PT to 6 pm PT Thursday, January 5 through Sunday, January 8th. You can check out the live coverage by visiting https://beterrific.com/live and www.facebook.com/Beterrifictv. BeTerrific is an online video, live streaming, original content network. BeTerrific provides engaging live/non live content to millions of fans around the globe focusing on the topics of tech, business, sports, entertainment and outdoor lifestyles. Viewers have access to compelling and often behind-the-scenes content they can't find anywhere else. Led by CEO, five-time Emmy Award-winning Michael Artsis, BeTerrific's expert storytelling and creative abilities bring to the forefront amazing stories, companies, technologies, methodologies and people. For more information, visit BeTerrific.com. LiveU sets the standard for high-quality and reliable live video acquisition, management and distribution over IP. LiveU's award-winning technology enables live video transmission from any location around the world with lightweight, easy-to-use equipment. From backpacks to smart phones, and satellite/cellular hybrid to external antenna solutions, LiveU offers a complete range of devices for live video coverage anytime, anywhere. In addition, LiveU offers extensive cloud-based management and video distribution solutions. With top-tier customers in 80+ countries, LiveU's solutions are being utilized for breaking and developing news and high-profile events, such as the FIFA World Cup™, Winter and Summer Olympic Games, Presidential Campaigns, Super Bowls, US Collegiate Championships and red-carpet events. LiveU's solutions include multiple 4G LTE/3G, HSPA+, Wi MAX and Wi-Fi cellular links, which are optimized for maximum video quality based on the available network conditions. For more information, visit www.liveu.tv, or follow us on Twitter, Facebook, YouTube, or Instagram.